Rental Registration #: RP150513 Newly renovated, this stunning five-bedroom home features brand new kitchen and bathrooms, an outdoor grill/kitchen, stunning blue stone deck with updated furnishings to top it all off! 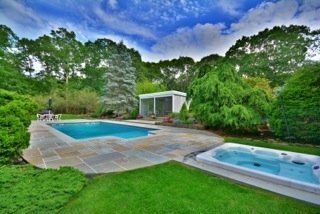 Enjoy a summer near the bay with your own private heated pool and tennis court, hot tub, and outdoor kitchen/dining. Immaculate landscaping --also updated in 2015-- on over an acre. Nice quiet area, close to harbors and entertainment..